The The Trackers transmit a 500 Milliseconds data packet, every 30 seconds on the VHF band. These can be received directly on a laptop computer, located at a nearby forward field base. The laptop has a hand held radio and radio Modem attached to it to receive the signal. But obviously, the Trackers may quickly get out of range when they disappear in the woods, or between the hills. So, for the same reason as voice repeaters are set up at a nearby hilltop for voice communication, a Digital Repeater (or Digipeater) must be set up to repeat the digital tracker packets (Often at the same location as the Voice repeater). 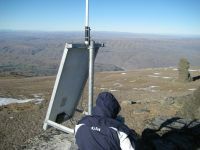 Also, as we have done in Central Otago, we now have a couple of permanent Digipeaters on high mountain tops, which pass on the received packets from the Trackers direct, or via other Digipeaters in range. This means a whole Network of Digipeaters pass traffic on, which can then be received by any station in the large covered area. However, Digipeaters work in a very different way then Voice repeaters. The Digipeater is a 'store-and-forward' repeater. 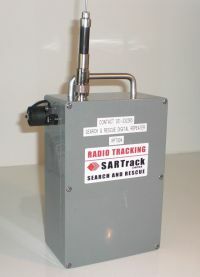 This means, the repeater receives a radio 'packet' from a Tracker. It decodes this packet and calculates the checksum. If the checksum checks :), the packet is accepted. If not, it is discarded. But before the Digipeater decides to re-transmit the packet, several things happen. To prevent multiple Digipeaters re-transmitting packets over and over again, they all keep a record of all received packets over the last 30 seconds. If they get an identical packet in that time, they will not repeat the packet again. But there is more. All Trackers are programmed with a 'Path' which tells the Digipeater how many Hops the packet may travel, from one Digipeater to another. It is therefore possible to program all Trackers to only pass through 2 or 3 Digipeaters, after it will stop. 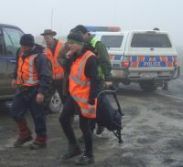 Lets say, we have a search in a gully in Balclutha. The search party starts by installing a Voice and a Digital repeater on a hill looking down into the gully. The Digipeater is also in range of the Blue Mountain Digipeater. And the Blue Mountain is in range of the Old Man Range Digipeater. The Tracker is programmed to Hop three times maximum. So, every time it transmits a packet, the local Digipeater will re-transmit it. But it will decrease the 'Hop-Count' by one. The Blue Mountains Digipeater does the same. And then the Old Man range Digipeater does it as well. But, by then the 'Hop-Count' is zero, and the Remarkables repeater (Uh, this does not exist yet, but still) will NOT repeat the packet anymore, despite the fact it did receive it. This is very important, as it limits how far a packet can travel. The Digipeaters themselves can also be programmed to limit the number of Hops. If another search is happening at the same time say in Queenstown, it is possible to remotely program the Old man Range repeater not to repeat any packets from the Balclutha search in either direction to free up the available bandwidth at both locations. We now have a system where a search in a local gully is re-transmitted over a large area, and it can be followed (and participated in) by base stations, like the Balclutha Police station, or the Alexandra police station. And all this without cellular coverage, or even voice connectivity. Text messages, including Map objects can be shared between all stations in range of the Digipeater network. Even better: if one of the stations has Internet access, it can pass all traffic on to an Igate Server (of which we have one running in an Auckland Telehouse area), and at that point, all stations with Internet access can participate in exactly the same way as if they could receive the packets by radio. 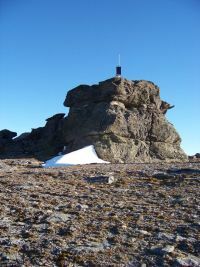 So even the Rescue Co-ordination Centre in Wellington could participate and communicate with the forward field base in Balclutha, without voice or cellphone connections. They only need the Software package. But despite all these possibilities, the primary object of the APRS system stands: It will work in remote areas, and is independent from cellular coverage or satellite coverage (except for the GPS satellites, of which there are many). We use the TNC-X board with the X-Digi daughter board. This combination has proven to be extremely reliable, and has nearly all the features we need. It also draws only a small amount of current, which is critical for the battery life of the Digipeater. A Vertex VX-160 hand held radio is installed in the waterproof box, together with a 7 Amp H battery, which gives the Digipeater about 48 our battery life under busy conditions. An extra power source like a car battery or a solar panel can be connected via the water proof connector on the side. The unit can also be programmed by connecting a laptop to the same connector. It is switched on and off with a key, which is removed when the unit has been installed at location. The complete unit weighs about 3.5 KG and can easily be carried in a backpack, together with the half-wave antenna included. However, in most cases you will need a small mast of 4 to 5 meters, to get the antenna above local obstacles. We build a few of these masts from aluminum pipes, together with ropes and pins in a 1.2 meter bag. The Digipeater can also be used from a car, with a magnetic antenna on the roof. This has already been proven very useful as a mobile 'fill-in' repeater. The power of the Digipeaters, as opposed to Voice repeaters, is that you can simply put one on one hill, another on the opposite hill, switch them on, and they all communicate with each other automatically, and transfer data between them, without any input from the field teams except to turn the key. But the important final stage of all this radio traffic, is where it shows up on the screen, with our purpose build software program.